In our attempt to visit the best restaurants in each city, we dined at Mercato, an Italian BYOB located in Philadelphia's Center City. 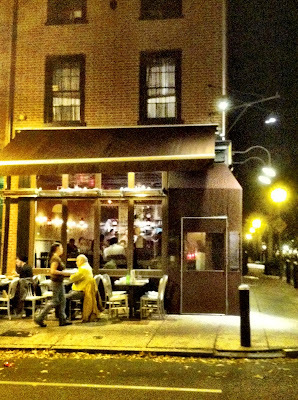 The Italian inspired spot currently sits at #25 in PhillyMag's Top 50 list, and it well deserving of it's status. The fact that it is a BYOB is an A+ in our books. Mercato has a very warm and cozy feeling to it. It is crowded with small tables, leaving you only an elbows distance from your neighbor and within earshot of the kitchen. It does not take reservations, so plan to wait and keep your after-dinner plans flexible (we waited approximately 45 minutes). There is not much of a lobby, so we recommend heading to Valanni, a bar across the street, where you can grab a drink while waiting for the host to call. Once seated, we opened a nice bottle of French pinot noir purchased at a on our own terms. Chuck and I ordered a cheese and meat to start and were way impressed by the amount of prosciutto presented to us. We also ordered the whole grilled artichoke based on reviews; it was good, but did not knock our socks off as anticipated. For my entreé I ordered the pan-seared diver scallops served with wild mushroom and spring pea risotto, truffle oil, and a large parmesan crisp. The scallops were perfectly seared and the risotto was creamy . Chuck selected the short rib ragu served with ricotta gnocchi, broccoli rabe, and shaved locatelli. We both preferred his dish, mostly because we have not yet mastered the art of braised short ribs. All the food was fantastic and if you are looking to try more of the menu you can order the tasting menu for $48 per person. As we have come to find in all cities outside DC (yes, we include NYC in that statement), the food was actually priced to match it's quality AND portion size. The restaurant is CASH ONLY, but with the BYOB feature you can easily walk out spending less than $100 for two with a full belly. Great date spot. We imagine it would be especially romantic on a cold and snowy evening. Megan's note: If anyone tries the pumpkin fettuccine please tell me how it is...I'm DYING to know. You guys came to Philly?! We have so many great restaurants. I've heard wonderful things about Mercato, but if you're ever in the area again, let me know and I can send some other restaurant suggestions your way. Happy 2012!